To ask other readers questions about The Myth of the Nice Girl, please sign up. This book came up in my goodreads feed and the subtitle 'achieving the career you love without becoming the person you hate' really drew me into the book. The author Franc Hauser had started her career at a huge accounting firm, then moved to media and is now a mentor and start-up investor. She felt the need for this book based on her own experiences in the real world on how to be nice and successful at work. It is not easy but comes with conscious practice. After all, who would want to work with a heartless task master? At the same time, you wouldn't want others to mistake your being nice for stupidity or weakness. I absolutely loved this book! It felt like I had a mentor speaking to me and guiding me to behaviors that would strengthen me. I have felt for a long time that I do not have issues holding my own in conversations or presenting and discussing information. As I read The Myth of the Nice Girl, a couple things came to mind, first that I am very fortunate to work for a mega-company that has built its brand on diversity and spends quite a bit of time and capital recruiting minorities, including women. I absolutely loved this book! It felt like I had a mentor speaking to me and guiding me to behaviors that would strengthen me. I have felt for a long time that I do not have issues holding my own in conversations or presenting and discussing information. As I read The Myth of the Nice Girl, a couple things came to mind, first that I am very fortunate to work for a mega-company that has built its brand on diversity and spends quite a bit of time and capital recruiting minorities, including women. What this book reminded me is that the vast majority of people, women in particular, are not so fortunate and work for organizations that may not consciously have bias but do, in practice, at least unconsciously hold different standards for women and minorities. The second thing that came to mind is that I do not do as well under all circumstances as I do in others, and I also am reluctant to assert myself sometimes, or apologize for doing so. Fran Hauser illustrated this and got me to see myself a little more objectively in that regard. I must admit that when I started reading The Myth of the Nice Girl, I wasn't sure that I was going to get much out of it. It initially felt a bit lightweight and fluffy. But the more I read, the more I started taking notes, and the more inspiring/helpful I found it. Fran Hauser shares challenging moments and lessons from her own stellar career as well as anecdotes from her friends and people she's worked with to help you better navigate the world of work as a woman. (Although, frankly, a lot of the advice is not just applicable to women.) She deftly balances between giving you theory and actionable steps. I ended up making a ton of highlights and bookmarks in my ebook as it was packed with useful information. Even better, I think it will not only help me personally, but also as someone who manages and mentors others. I got this because I mentor young women. There are some sections specific to women and sexism, but much of the book could apply to “nice people” in general. I expect numerous tips will be useful. An enjoyable read, but one that seemed more suited to younger women in their career journey. I did find the Four Square Model to be a helpful tool for identifying and focusing on my personal priorities, and I’m excited about implementing that concept in my own life. I wish I’d had been able to read a book like this fifteen years ago! Mixed feelings about this book. Some advice was the same as many books like this that didn’t feel new or exciting, some was good advise (the last few chapters like mentoring) was good but some advise is tough to scale down to the smaller organizer people like me and many of my friends work for. I know she has a great resume and experience but I got sick of hearing about these big unrelated companies she’s worked at. I absolutely LOVE this book. Women do not have to be a bi*** to be in charge and Fran shares stories about herself, her mentors and her colleagues to show how this can be done. She also includes stats about the wage gap and this one about men vs. women applying for jobs: Men often apply for jobs when they meet only 60% of the qualifications. Women need to ask themselves if they're 60% qualified. 1. Pay attention to the way you ta I absolutely LOVE this book. Women do not have to be a bi*** to be in charge and Fran shares stories about herself, her mentors and her colleagues to show how this can be done. She also includes stats about the wage gap and this one about men vs. women applying for jobs: Men often apply for jobs when they meet only 60% of the qualifications. Women need to ask themselves if they're 60% qualified. 3. If something at work bothers you (or in life for that matter), say it! Spare yourself a week of analyzing and advice from friends and just squash it in the moment. 4. Understand if you're doing something because you want to, or because it will please someone else. LOVED reading this book. It explains why being ambitious / successful is not at odds with being nice and offers a credible and practical framework to develop an authentic voice / professional persona. Fran shares engaging case studies and anecdotes that showcase how executives have been able to straddle being successful and nice. It's inspiring to read and exciting to have tools to put into practice. Can't wait to share this book with friends and colleagues to spread the message that authenticity LOVED reading this book. It explains why being ambitious / successful is not at odds with being nice and offers a credible and practical framework to develop an authentic voice / professional persona. I was pleasantly surprised by this book. I was expecting a book to teach me to become tougher and how to use my niceness to achieve this. This is what I been reading too many other places that you cannot become successful and be nice at the same time. This book showed me how to use my niceness as an factor in my work, and how to make it my "weapon". I am greatfull to read a book about how to be nice and still succeed in business. Niceness is one of my traits that I like the most, but are the most I was pleasantly surprised by this book. I was expecting a book to teach me to become tougher and how to use my niceness to achieve this. This is what I been reading too many other places that you cannot become successful and be nice at the same time. This book showed me how to use my niceness as an factor in my work, and how to make it my "weapon". I am greatfull to read a book about how to be nice and still succeed in business. Niceness is one of my traits that I like the most, but are the most skeptical towards, therefor I am happy for a book that tell me to be my self! This might be the most illuminating, affirming, and helpful book I read all year. And I'm reading a lot of good books so that's saying something. I picked this up from the library and now have a copy in my Amazon shopping cart. I have a feeling I'll need Hauser's words as a reference in future days. This book is fantastic and is a must read for any female executive or employee. There are so many valuable lessons in here that are going to help me as a female CEO, lessons that will help my young managers, and even our most junior employees. There were 30+ actionable suggestions in this book that I am starting to incorporate into my company's work today, and I just finished the book yesterday! Fran Hauser has worked everywhere and has the tips and recommendations people need to really make the most of their careers. Filled with solid frank advice, it is the guide for getting what you want regardless of where you are in your career. In my opinion, it’s a must read for every female or male who wants to achieve their career dreams. Let us take a minute to appreciate the cover of this book. I have picked up and read many leadership/self-help books in my short millennial life mainly because of the buzz around an author's great accomplishments. In addition, I am not one to judge a book by its cover but I have to admit this was sourced from Netgalley purely because of the cover. I had never heard of Fran Hauser in my neck of the internet woods until I got through this book.You can see her accomplishments on her website. In The M Let us take a minute to appreciate the cover of this book. In The Myth of the Nice Girl, Fran unpacks from her extensive corporate experience how she was able to harness her 'niceness' into a superpower and achieve her career and general life goals. Drawing mainly from her own experiences and the women that she has mentored over the years, she gives specific examples of how colleagues (because we tend to spend most of our lives working) can easily mistake 'niceness' or 'kindness' for weakness. Women are caught in a double-bind because if they are nice, they are labelled pushovers, mediocre and people pleasers. On the other end of the spectrum, if they are firm and speak up, they are regarded as arrogant, selfish or rude. One of the major issues that Ms Hauser tackles in the book is saying no especially when you feel that it could strain a relationship. Popular career advisors will state that is important to go above and beyond one's call of duty so that you can not broaden your skills and portfolios but also increase your visibility in your company. However, what they may not openly state is that when you say yes to a new project, you also say no other things like time with your loved ones or "self-care" time. "I've been struggling with how to talk to you about this. Over the past two weeks, I've had to change my personal plans three times at the last minute to stay late. I'm afraid my boyfriend is going to break up with me! But truthfully, I wonder if this is a good opportunity for someone else on the team to step up and pitch in." Examining this response, Fran was respectable with her boss but still got her point across with a touch of humour. You bet that she not only gained her boss' respect but also from her colleagues. Since she was able to get him to spread pending work more evenly among her team members in future instances, giving them opportunities to shine. Some people regard books in the female leadership space as propagating male-bashing. This book is nothing of the sort. Fran clearly shows through examples from both male and female colleagues that it is important to correct people especially when they are inappropriate or acting as bullies. As humans, we are prone to err. That said, it is important to use that situation as a learning point and know when it is time to escalate the issue. Aside from the stunning cover, readers will appreciate Fran's seasoned advice and the step by step strategies on how to establish boundaries, negotiating "win-win" deals while being nice, up your networking game and to speak up at meetings. For self-help junkies, this book might have very familiar content but it you will appreciate the anecdotes and help you muster the courage to make small but life-changing styles. With endorsements from heavyweights like Arianna Huffington and Randi Zuckerberg, The Myth of the Nice Girl poised to be a bestselling hit, so keep it on your radar. I both loved and slightly dis-liked this book. - Each chapter addresses a different aspect of professional lives; not just 'at work'. Which I really liked. - She also discusses that 'having it all' is different f I both loved and slightly dis-liked this book. - She also discusses that 'having it all' is different for different people and also different depending on what stage of your life you are in. Whoo hoo! Someone said it. I can be happy with where I am. I don't have to lean in every... single... day. - I felt that there was a lot of company name dropping. Yes, I get that it helps you speak from a position where we will trust what you're saying because you worked for Coke/Time/etc. But it started to feel like the book could have been about half as long without it. - I get that women have a unique problem at work. (trust me I do, I'm a female engineer). So this book was going for a specific market. And some of it definitely applies mostly to women. But the aspect of how to be nice genuinely kind person and a good employee who isn't exploited or overlooked.... I know a lot of men who need that advice too. Maybe a companion book for the guys? I finished this book feeling uplifted, recharged, and hopeful about my career. Fran formats the book beautifully to make each chapter digestible and engaging. 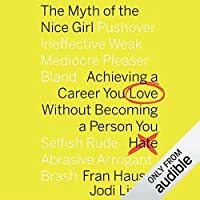 Each chapter opens with statements from different women that help reveal the mixed messages and beliefs "nice" girls navigate in their careers. Fran then shares anecdotes about her own career, friends' careers, and situations her mentees have experienced that have given her insight into how to successfully navigate these double standards. I finished this book feeling uplifted, recharged, and hopeful about my career. Fran formats the book beautifully to make each chapter digestible and engaging. 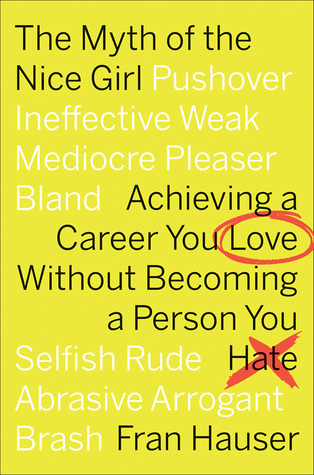 Each chapter opens with statements from different women that help reveal the mixed messages and beliefs "nice" girls navigate in their careers. Fran then shares anecdotes about her own career, friends' careers, and situations her mentees have experienced that have given her insight into how to successfully navigate these double standards. At the end of each chapter, she sums up her suggestions and methods into an actionable, bulleted list. I found the chapter "Set Boundaries and be Caring" to be particularly useful at this stage of my career. I especially liked the idea that there is a sweet spot between yes and no, where you can be helpful and caring by offering something small and thoughtful when you don't have the capacity to deliver on a larger ask. I think this idea of showing up and being thoughtful while making space for yourself is an important theme throughout the book. I read this book for a "Women in Leadership" group at work. The title was intriguing and there are a few good suggestions, but partway through I was over the name dropping. "A candid guide for ambitious women who want to succeed without losing themselves in the process. In The Myth of The Nice Girl, Fran Hauser deconstructs the negative perception of "niceness" that many women struggle with in the business world. If women are nice, they are seen as weak and ineffective, but if they are tough, they I read this book for a "Women in Leadership" group at work. The title was intriguing and there are a few good suggestions, but partway through I was over the name dropping. Really amazing in its practical advice about navigating the work place and networking. I feel like while reading it I keep having moments of sitting it down to shoot of an email to someone I've wanted to reconnect with. It's helped me out of what had felt like something of a rut at work. I really can't recommend it enough to others who might be early on in their careers and not knowing how to really make a next step without feeling like they're taking up too much space by asking for more. Very useful tips and examples. Fran also perfectly described the dilemmas a nice girl could be met with at work. I really loved her devotions into mentoring young women without connections and gave us concrete ways to use if we need the help. The only reason why I have it a 3.5 was that I feel that my life hasn’t yet reached the point where it can perfectly resonate with these tips. But if I come back to this a year or two, I’m sure this will be helpful in a impactful way. This is just a bland career advice book whose central message is: don't be a jerk, but don't be a pushover. It's an important message (sadly), but I think it mostly applies to people (I mean, women) starting out in their careers. This audiobook was something that I could not stop listening to! It was a very insightful look into scenarios that are common for women in the workplace and how to address common themes. I found myself nodding and laughing to several anecdotes. Excellent book!